ACME HOSTEL has SUPERB LOCATION: right in the city center, just 50 meters away from Nevsky prospect and 200 meters away from Gostiny Dvor metro station. Main sights of the city, shops, cafes, bars and nightlife spots are in a short distance! Occupying the 4th floor of a 5-storey building without an elevator, Acme hostel can accommodate 32 guests in 5 well-furnished dormitories all with comfortable mattresses & pillows. We are open 365 days a year and have 24 hour security. Our friendly multilingual reception staff is available round the clock to help you. Breakfast is not served in the hostel, but you may use a fully equipped kitchen in the common area. Coffee & tea are available for free any time. FREE WiFi 24/7 in common areas and dorms! FREE usage of lockers (refundable deposit for the key is required)! FREE laundry (just bring your washing powder)! FREE safe at the reception for small valuables! FREE tea & coffee any time! FREE bed linen & towels! FREE use of hairdryer and iron! FREE VISA SUPPORT (prepayment of your stay is required)! FREE guided walking tours by locals! We take 400 rub. deposit for towel and keys. We\'ll give it back upon check-out! - Random events organized by hostel. We are glad to welcome guests over 18 years old or children over 14 with adults. No age restrictions will apply for group reservations if you book the entire hostel. SEE THE DIRECTIONS in \'Map & Directions\' Hostelworld tab before coming! 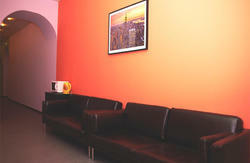 Acme hostel boasts superb location just 50 meters from the main city thoroughfare Nevsky prospect. 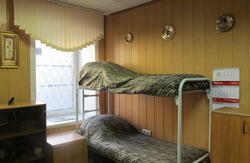 The exact address is Sadovaya Street, 11 and the entrance to the Acme hostel is from the street. Walking along Nevsky prospect, come to the junction of Nevsky and Sadovaya street and turn to the street. Now you are on Sadovaya street with numerous cafes and restaurants. Go straight along the street on its odd-numbered side to the house 11, guided by the sign boards of Hairshop. This small shop is situated on the ground floor, while the Acme hostel - on the 4th floor of this 5-storey building (without an elevator). There are a few steps up and to the right you'll see the shop entrance, while the white building door, leading to the hostel, will be in front of you. Press the Acme hostel button (video-security system), push the door, go upstairs to the 4th and find the dark brown door with the 'Acme Hostel Reception' sign. Thus you enter the hotel. Welcome!